There’s an awesome little restaurant and brewery tucked away where you might never find it … if you didn’t have us to send you there. 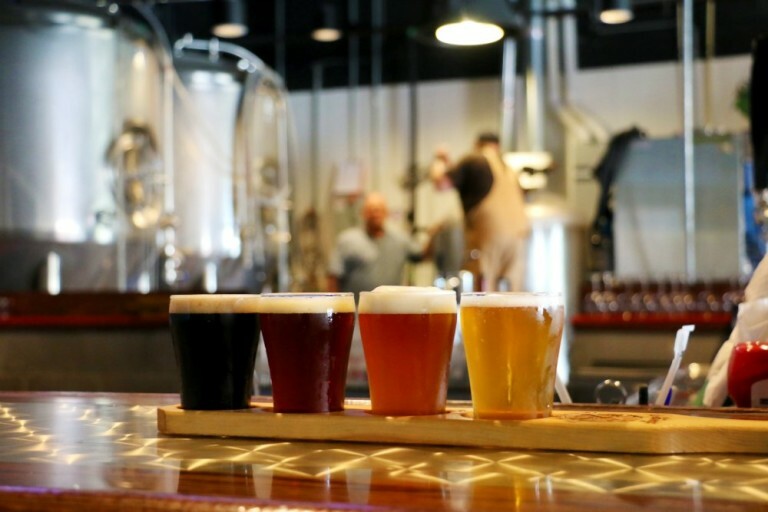 Located in the Publix shopping center at the foot of the Brooks Bridge (Downtown Fort Walton Beach, not Okaloosa Island side), you’ll find Props Brewery & Grill. There are four owners, and they’re all awesome. Meet Travis Peterson, Michael Kee, Nathan Vanatter, and Brian O’Neill, who also serves as General Manager. Travis, Michael and Nathan have all served in the U.S. military. The latter two were both pilots, and Travis (still active duty) is a helicopter door gunner. Michael is in the reserves, and Nathan has retired. Hence the name … Props. The entire restaurant is WWII aviation-themed, from the names of the brews to the decor. Even the beer taps behind the bar look like bombs and airplane propellers. Michael was home-brewing for years before the quartet founded their brewery. They started small in 2012, and have been growing ever since. If you like what’s on tap, Props beers can be purchased at Walmart, Wine World and Whole Foods from Pensacola all the way to Panama City Beach. So you can take a six-pack back to our beachfront hotel to enjoy on your private balcony. 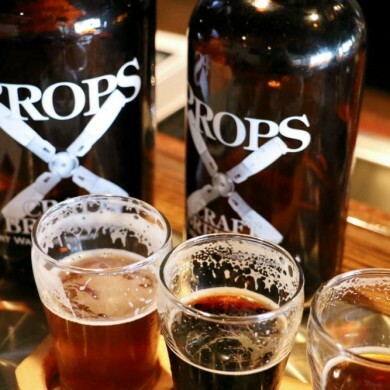 A second location is forthcoming, where Props will brew more beer for distribution. 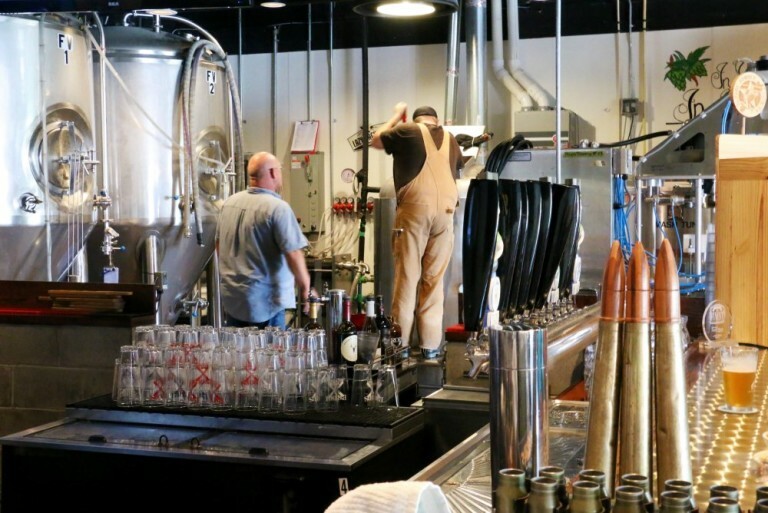 In fact, when Travis left to meet with the architect, we got to talk to Lyle Hari, a Props brewmaster who explained the complex science of brewing beer. Lyle, too, was home-brewing for years before he started here. If you want his science lesson, you’ll have to come in for yourself. You can watch Lyle and his comrades work their magic right behind the bar. Bartender Paris commented that sometimes when you walk in, there’s the strong, bready smell of yeast cooking. If that’s not enough to make you want a pint, we don’t know what is. For a sample, we recommended ordering a flight of beers, which takes on all sorts of lovely wordplay when set in a bar founded by pilots. Jovie Ale (Get it? Jovial, people! How you feel around the holidays!) makes its appearance every winter. In addition to their fine brews, they serve traditional pub fare such as sandwiches, burgers and baskets – each with a recommended beer pairing. The batter for the Fish and Chips is crafted with house-brewed 4 Kings Brown Ale. For more menu items, click here. With several flat screen TVs on the walls, it’s a great place to catch a game. Don’t forget your souvenir growler, in either 32 or 64 ounces.